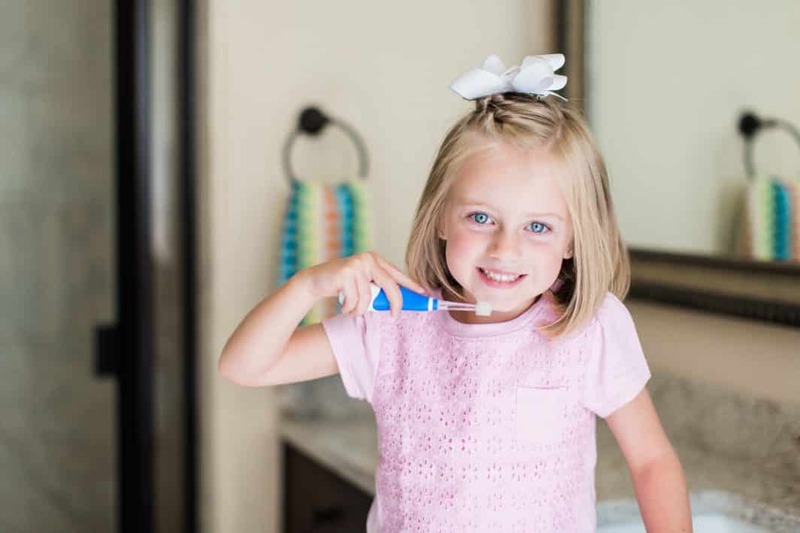 Getting your kids to brush their teeth–let alone to WANT to brush their teeth–can be a major headache. You’re already trying to get them to pick up their room, take a bath, and go to sleep. This is why some parents skip the extra drama and allow their kids to swish and spit or even skip the brushing all together. “They’re just baby teeth. They’ll fall out anyway, right?” Yes, but really no. Here’s why that’s not a good idea . . . Your child will experience tooth decay, which can cause your baby’s teeth to fall out too early. This then causes their permanent teeth to move into the empty space and make it difficult for other adult teeth to find room when it’s their turn to surface. Cavities. They are painful for your child to experience, and painful for your wallet, too. People may not think that cavities in baby teeth are a big deal, but they can have long-term effects on your child’s oral health and well-being. By not taking care of baby teeth, you are also not caring for their gums which stay with them forever. That’s kind of a big deal. If the gums and site of the tooth growth are not well cared for, this will impact the growth and health of adult teeth. It can also cause teeth to grow in crooked. That then means a much, much higher need for braces. Essentially, unhealthy baby teeth will lead to unhealthy adult teeth. This is why proper oral hygiene is so important as soon as your baby is born. Now that we understand why we need to take care of those baby pearly whites, how can we get our kids to want and enjoy brushing their teeth? 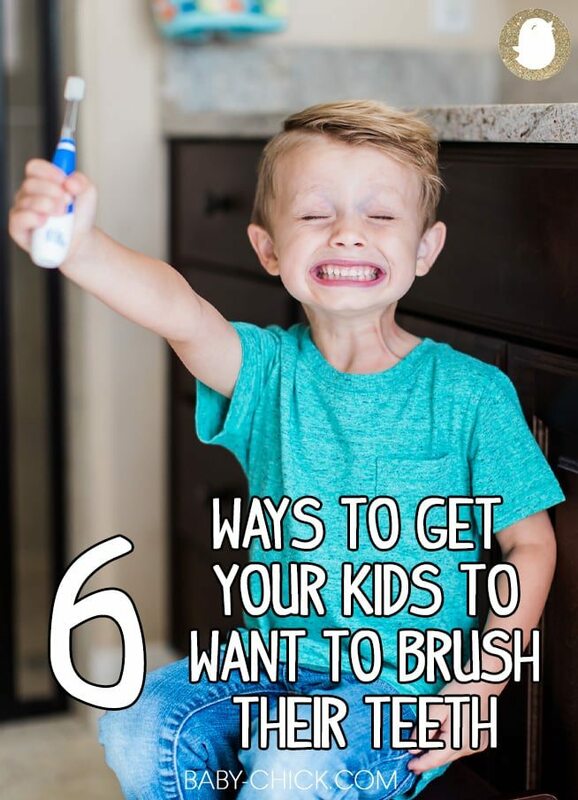 We’ve discovered a company that can help with that, and are sharing six creative parenting ideas to get your kids excited about brushing their teeth. A boring, normal toothbrush usually doesn’t get kids very excited about brushing. Telling them that you are getting them a cool toothbrush made just for them–big kids only–will peak their interests a lot more. 🙂 Baby Buddy makes it easy by designing an oral care kit that covers every age. 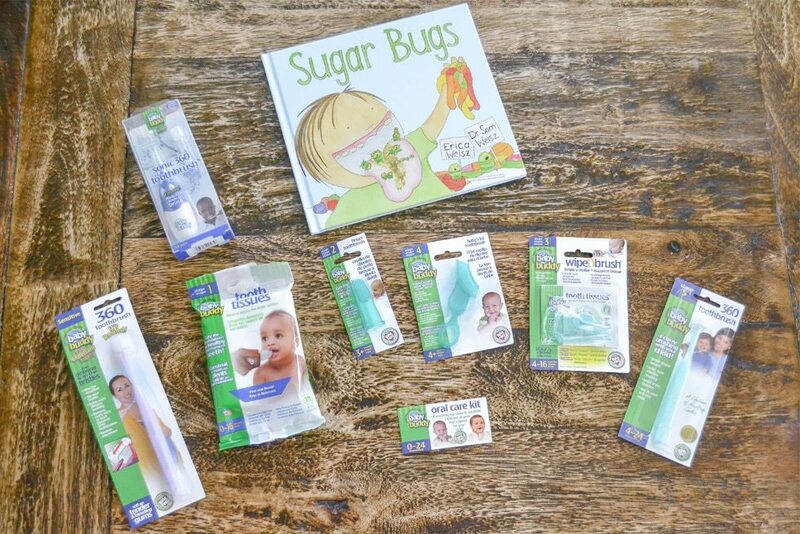 Step 1: Tooth Tissues – can be used from birth to 16 months. Tooth Tissues® are certified natural oral wipes that helps parents start on the path. The best part? They are natural, giving parents peace of mind when they use them daily. Tooth Tissues® are bamboo wipes that are bubble-gum flavored and fluoride and paraben free! Step 2: The Finger Toothbrush – perfect for 3 months through 18 months of age. Pediatric dentists recommend cleaning your baby’s gums–even before the first tooth appears–with a soft infant toothbrush and water. Properly cleaning teeth and gums helps remove sugar and bacteria that can lead to future decay. This also features a textured side for massaging those tender gums! Step 3: Wipe-N-Brush – for ages 4 months through 16 months. For parental use once new teeth come in until first molars come in around 16 months. 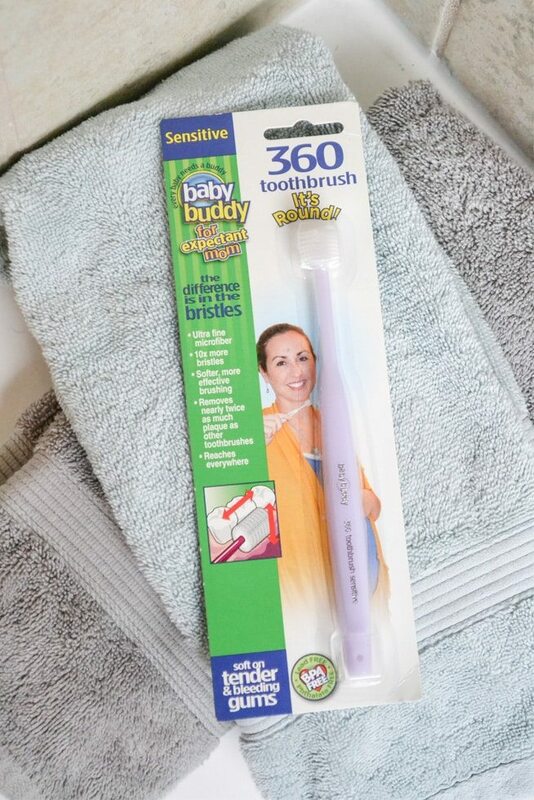 Step 4: Baby’s First Toothbrush – recommended from 4 months through 8 years of age. 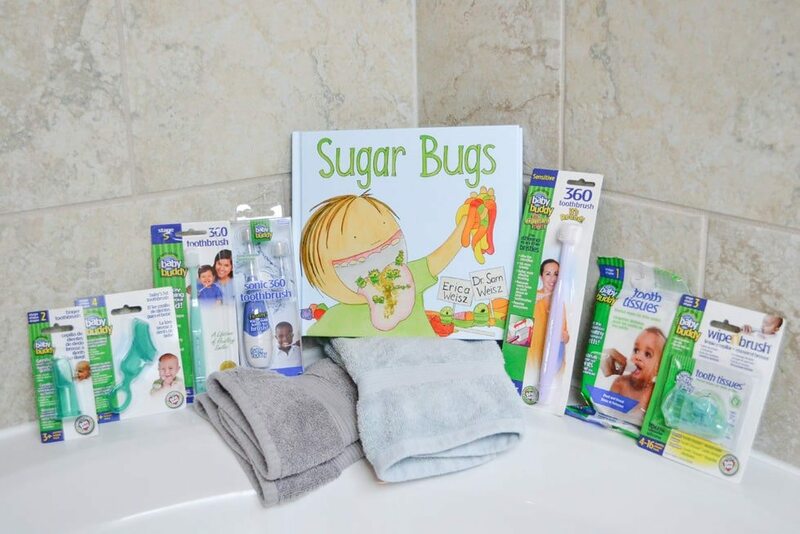 Step 5: Brilliant Baby Toothbrush – for ages 4 months to 12 years that easily clean those hard-to-reach places where food and plaque can build up and cause cavities and other oral problems. 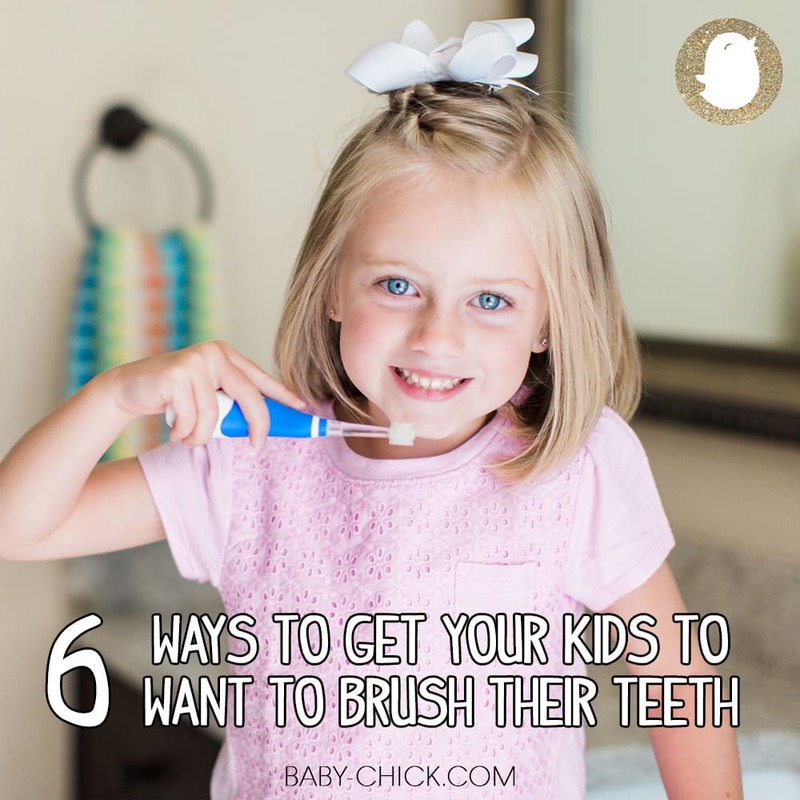 Step 6: 360 Toothbrush – for ages two through 12 years old. The world’s first 360˚ designed toothbrush with 10,000 micro fine bristles offers softer, more effective cleaning than the average toothbrush. For parental use and/or parental supervision of toddlers and adolescents to clean teeth, gums, and tongue. 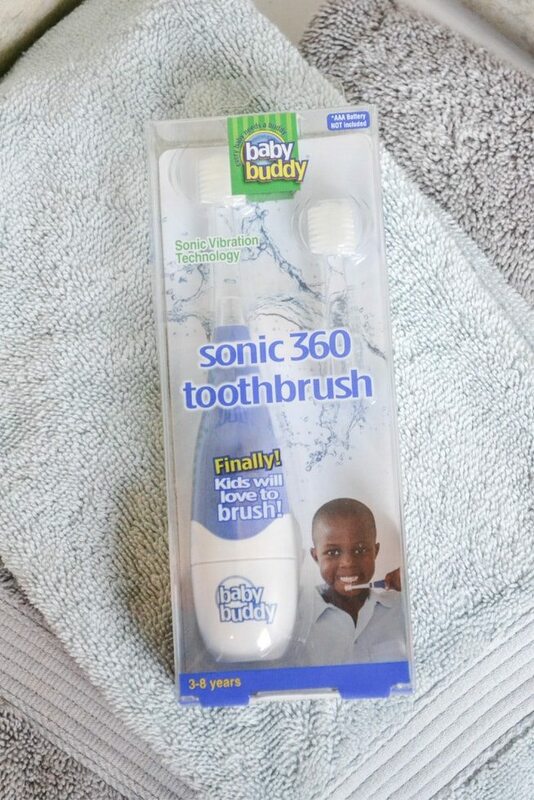 They even have a Sonic 360 Toothbrush for kids three to eight years old. If your child is wanting a grown up brush like yours, they will love this brush! The super-soft bristles and gentle sonic vibration create fizzy water bubbles that clean your child’s teeth and gums with ease. It also lights up and buzzes for two minutes so that your child knows how long to brush for a healthy smile. It’s a family favorite! Little ones want to be just their their mommy or daddy. This is why they like to watch you put on your makeup in the morning or shave your face. They are little sponges and naturally want to copy you because they want to be like just like you. Take advantage of this time and lead by example. Show them how you brush your teeth and tell them why it’s important. 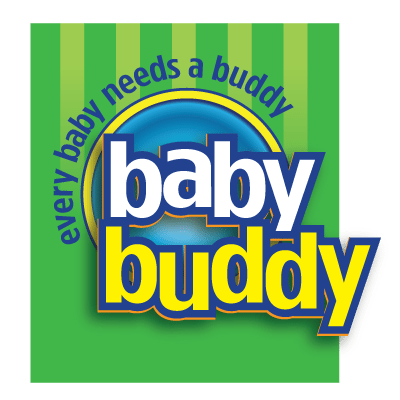 If you’re expecting like I am, Baby Buddy even has a sensitive toothbrush for expecting moms! The taste of toothpaste can really turn your child off from brushing. Their little palettes aren’t ready or wanting the traditional mint flavor. Boring! Find a flavor and a brand that has quality ingredients that will take good care of your baby’s teeth but also taste good. This strawberry-banana paste has been a big hit! First of all, I’m not saying that you should pay your kids to brush their teeth. No, that’s not what I’m suggesting at all. What I am suggesting is setting up a rewards system for their dental care. Maybe you can create a tooth-brushing calendar and they get a sticker for every time they brush their teeth. Or maybe your child will get to stay up an extra 30 minutes if he brushes his teeth every day, twice a day for a week. Maybe 30 days of constant brushing will lead to a big prize. It’s completely up to you. Children do respond well to positive reinforcement so a reward after completion could be just the trick for your family! Do a contest to see “who can brush their teeth better.” Brush right next to them and see how they do. Just be careful that they aren’t brushing too vigorously since this can cause gum damage. Set a timer on your phone to two minutes and see which of your children can brush their teeth the longest. (Dentists say that proper tooth-brushing needs to be a full two minutes.) If one or both of them give up before the two minute timer goes off, they don’t get a sticker on their tooth-brushing calendar. With the book’s light-hearted, engaging illustrations and dental friendly language, it’s a perfect introduction for children to discover the importance of taking care of their teeth. 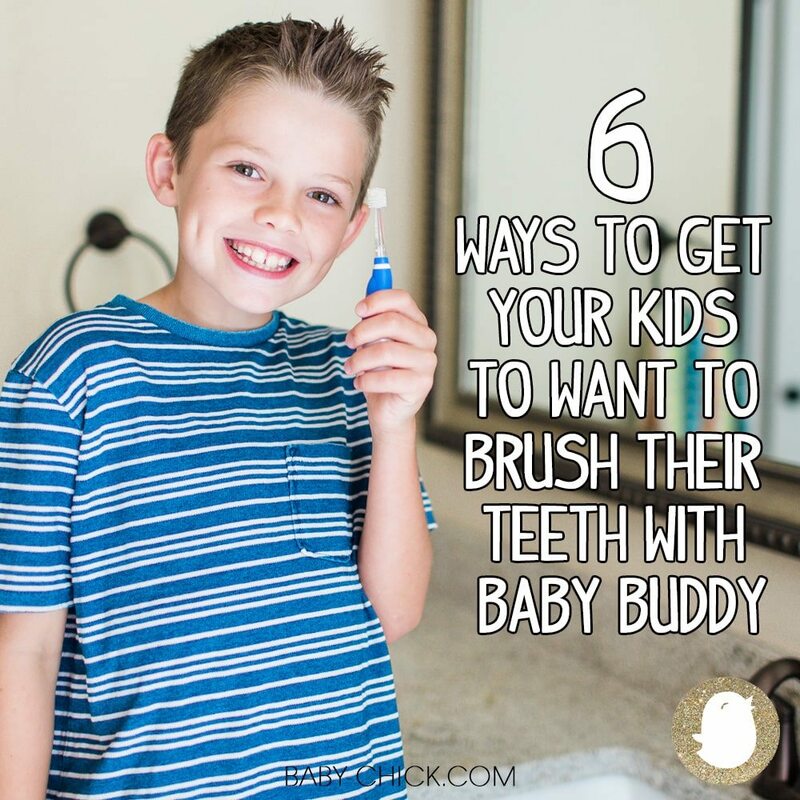 Getting children to brush their teeth can be a chore, but we’ve found it to be a lot easier and more fun with these tips and by using these Baby Buddy products. So cheers to healthier and brighter smiles!